A discussion including a panel of many local state, education and law enforcement officials convened at Shrewsbury High School last week to discuss the state’s opioid epidemic. 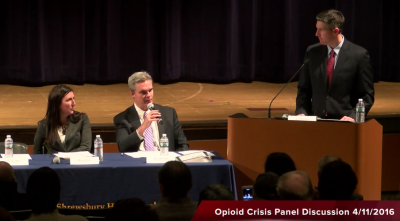 The panel was sponsored by SCAPE (Shrewsbury Coalition for Addiction Prevention & Education) and co-sponsored by District Attorney Joseph D. Early, Jr. Central MA Opioid Task Force, State Representative Hannah Kane, and State Senator Michael Moore. Watch the full event here. Westborough is currently considering a similar event for public awareness and education.